Yamaha announces new AV receivers, plus Tidal and Deezer come to MusicCast | What Hi-Fi? Yamaha's new range of AV receivers feature 4K, HDR and Dolby Vision, plus Bluetooth for streaming from a phone or tablet. 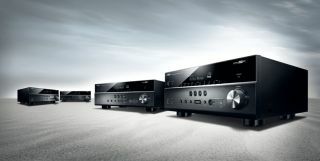 Yamaha has launched four new AV receivers, all of which are compatible with its MusicCast wireless multi-room feature. The company also announced that MusicCast now supports the Tidal and Deezer music streaming services. The four new receivers support 4K, Dolby Vision and HDR, so you can experience some of the latest breakthroughs in audio and visual entertainment. The higher-end RX-V583 and RX-V683 (both 7.2-channel systems) support Dolby TrueHD and DTS Master Audio, too. Each model has Bluetooth for wirelessly playing tunes from your phone, tablet or PC. All systems from the RX-V483 upwards feature Bluetooth transmission as part of MusicCast, so you can connect a pair of wireless headphones to your receiver. They all automatically calibrate to your room for the best sound, while the RX-V683 also accounts for reflective surfaces and awkward furniture. That model features an MM phono stage too, so you can play records through your home cinema system. Fire up MusicCast, and you can stream your vinyl all over the house. MusicCast now supports Tidal and Deezer, enabling their libraries to be streamed throughout the home. These services will also be available on older MusicCast-compatible Yamaha systems via a firmware update. The 5.1 channel RX-V383 (£380) and RX-V483 (£430) will go on sale in May, with the RX-V583 (£530) and RX-V683 (£630) following in June.